This is issue #139 of the Dogwaffler of the Moment, the newsletter about Project Dogwaffle. 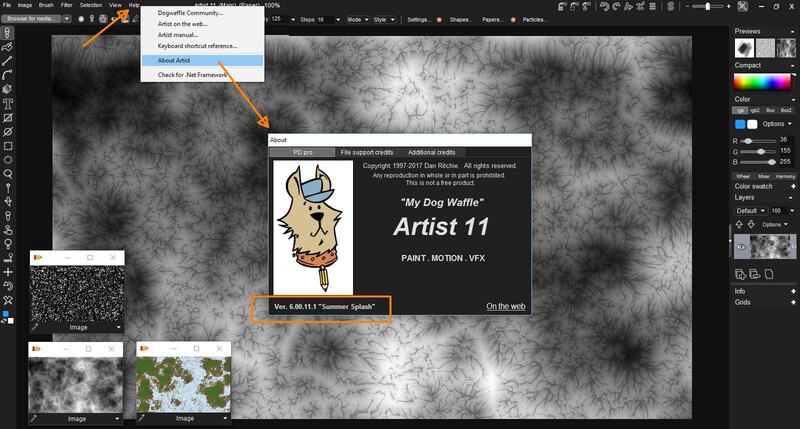 PD Artist v11.1 is here: the Summer Splash continues! What's New in PD Artist 11.1, Summer Splash? New to PD Artist? Launch Promotion! DOTM: tiny imaginary(?) 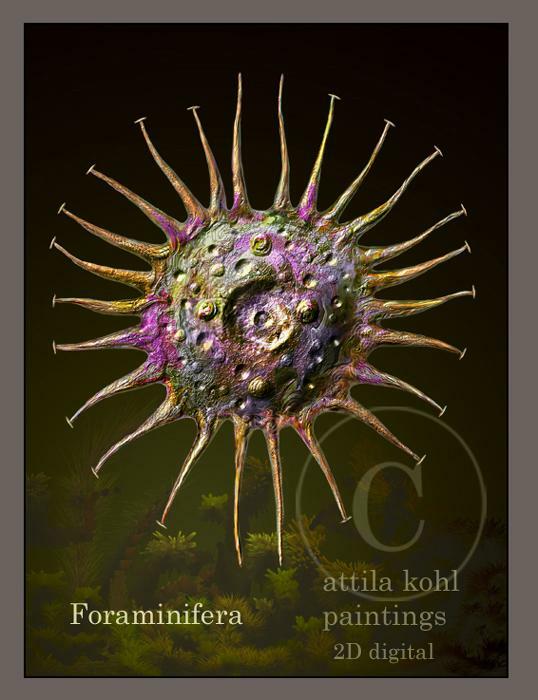 creator's creatures - Foraminifera from Mars? The Last Draw: Is it Real, or is it Puppy Real? If you have PD Howler, you don't need PD Artist. It's all part of PD Howler. If you however have an old version of PD Howler, or even PD Pro 4 or 5, before the split into the Howler edition vs. Artist edition came about, then you could still be interested in getting PD Artist 11.1..... you'd give up animation tools and tools for working on video clips, but why pay for those if you only do still imagery? To put it poetically: PD Artist is for those who don't blink (or at least see no difference between before and after blinking). As you will recall, PD Artist is essentially a subset of PD Howler, where we removed most of the features for motion: video tools and Animation. There are a few exceptions: custom brushes in PD Artist can still be animbrushes too, i.e. coming from an AVI video or by loading an image sequence. You can load an image sequence into the brush and paint with it - just onto a single image, at that point, no longer on another animation, nor another image sequence or video. That's a privilege reserved for the Howler edition - painting with video on video, howling fast and versatile. The Howler edition also adds a group of filters not found in the Artist edition. The Particle Modeller is one of them. If you're intrigued enough by now and think you might want to use some of Howler's tools after all, get Howler. If you are focusing on PD Artist, for a number of good reasons, including budgetary considerations, read on. You'll explore new features that are shared between PD Artist and PD Howler, so we may send you to PD Howler documentation in some cases, and it certainly doesn't hurt to learn from Howler tutorials. Even if you end up applying only the parts coming for PD Artist. 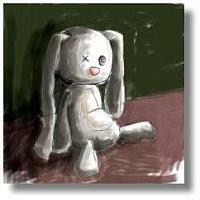 - as of this writing, the latest is RC56 (release candidate 56). This may evolve some more. - Fixed a bug in specular reflections. Specular reflections were isometric instead of perspective. - Detail textures (bump maps) now use the fog depth distance instead of rendering only in the first unit, so that objects far away can still have some texture. - The L-Systems feature has been internalized, replacing the plugin version, and further improved too, using XML format for the saved settings instead of binary file format. - Curve tool: Rendering a brush stroke or Painting a brush along a curve now also supports the animbrushes. For example, if you have a looping walk sequence coming from your favorite 3D or 2D animation tool, you can now render it across a path along a predictable, previewable, editable path before you commit it. - We added a number of new watercolor media presets in the Media browser. Maybe you'll find some that you like? Happy painting! - Shading on particles and foliage brushes is now an adjustable slider instead of an on/off checkbox. The dark side of a bush or tuft of grass doesn't have to be so dark after all. - Fixed a bug in foliage rendering. 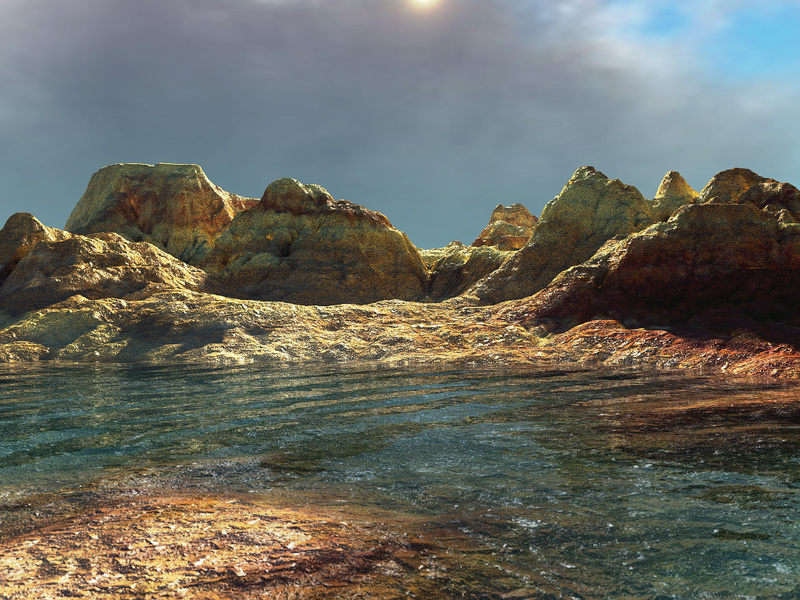 Ambient color was not properly initialized, resulting in foliage being darker than expected. - Fog color indicator was in the wrong place on the particles brush panel. - 3D Designer... We removed the "reverse" checkbox because it had little impact on erosion. We replaced it with "Viscosity," which is another parameter in the algorithm that already existed, but was not displayed from the interface. 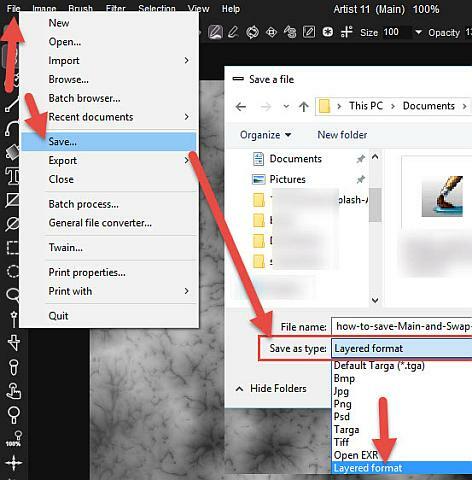 It was already shown in the interface of the separate Erosion filter under Filter > Stylize. Now it is also accessible in 3D Designer. Subtle as it is, you may find it useful for the different look, such as that difference between lite rainfall erosion on hard marble or granite vs. heavy wash erosion on sandstone. 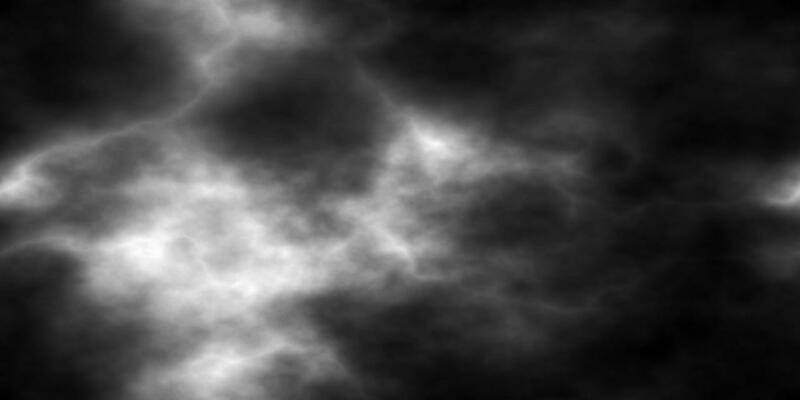 One tool that has been updated in the Howler edition is the Particle Modeler (for volumetric clouds). It is not available in the Artist edition, as it is part of the Animation submenu in Filters. We have added support for Sprites and animated sprites in the Particle Modeler. If you're interested in this feature, please consider upgrading to PD Howler. We can get you a big discount for upgrading. If you ordered directly from Dan or through www.squirreldome.com (with various fullfilment options, such as paid by paypal and delivered by download link from dropbox), please contact Dan for a new link if you didn't get one yet, or wait a few more days. If you have PD Artist 10 or 9.6 you can get better discounts with your upgrade discount coupon. Contact us if you need a new coupon. Enough said..... Check this project. Looking for more tutorials and latest examples of renderings or animations and videos? There are a few more on our channel. In this section, we'll occasionally introduce content which you can use royalty-free. Well, in some cases 'just' free, for non-commercial use, but you can learn a lot and then do your own. You'll find elevation maps and color maps - just a few at the moment, but more over time. We'll be adding new elevation maps here over time, so you can return and grab some new maps to do your own renderings with. By-the-way, some of these elevation maps may originate in clouds, or vice-versa: just because they're shown being made and used for terrain height maps, or color maps, that doesn't mean you couldn't also use it for other purposes, such as sky maps. The Last Draw: The Last Draw: Is it Real, or Puppy Real? And that's a wrap, for now. Thanks for waffling and howling! 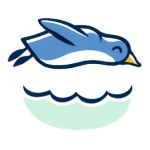 The good news: You can also use the above link to take other steps: such as to add yourself as a new recipient of our sporadic newsletter, or to change your email address on our records by adding yourself with a new email address and then requesting to remove the old email address. Or, contact us, Phil and Dan, here with clear instructions about which one of your multiple emails to add or remove, or with any other questions: http://www.thebest3d.com/dogwaffle/about - Please do not send attachments unless invited to do so and beware of the format and file sizes. All content presented herein is owned by their respective owners. No reproduction is permitted without written consent from the copyright holder. Trademarks and registered trademarks are used for identification purposes only. No affiliation, endorsement or commercial favors are implied or intended.